Firstly, an Office Supplies Yurt from Redfox! At my prompting, Redfox has also provided instructions on how to make your own Office Supplies Yurt, an activity I am planning to adapt to my own Belgian needs imminently. The walls (wall?) 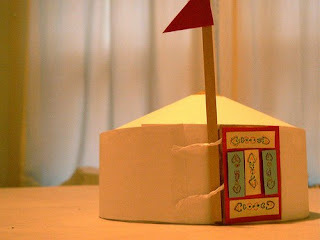 of the yurt is composed of large-size index cards that have been cut in half lengthwise and taped together into a misshapen ring. The misshaping is optional, but I feel it adds a certain charm. The roof is a very wobbly circle cut out of letterhead, because I had nothing round of a suitable size to trace, and no compass. Wobbly circle a bit bigger than misshapen yurt ring, with a few tabs around the edges to give something to tape to the wall(s). Then I made a single cut from the edge to somewhere near the center, and folded over to make a shallow cone. Much fiddling, untaping, and retaping of both cone and ring ensued before the two would approximate fitting together. More tape. Tape, tape, tape. Door: Sacrificed a bright red file folder that had obtained a coffee stain at some point in its life. The same file folder provided the pennant for the flag. Yellow and blue panels are made of Post-It, decorated with a combination of roller-ball and felt-tip pen. Make your own! Yurts go viral! Predictably, my gay son has been overreaching himself with a magnificent potato based entry. Do take your time and study it. Those potatoes lead rich, interesting lives. 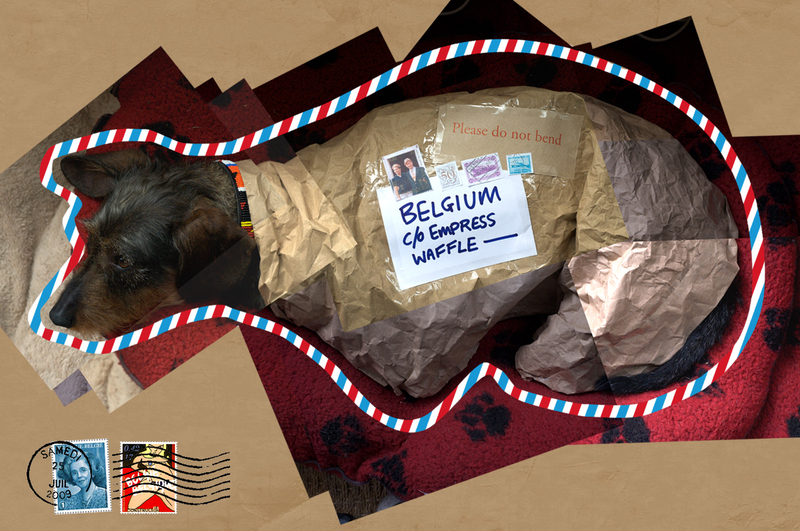 Then, he wrapped his sausage in brown paper and sent it to me! I LOVE MY GAY SON. But don't worry, I won't be judging so let there be no accusations of bias. Here, not exactly a fête entry, more of a pitiful failure, is my Bonne Maman puppet, observed by dinosaurs. This is all I have for you. I am experimenting with the correct vegetable medium for the jerboa, but have yet to find the right blend of frisée, cauliflower and something with a long stalk. Hmmm. Where in the name of fuckery is Dr Capybara? This is unacceptable. I was promised answers. Dr Capybara would have offered sweet, but swift, (and never) merciful release! Both potatoes and sausage are superb. Maybe Dr Capybara would like to repose inside the yurt? A yurt of one's own, I hear, is very stimulating to the mind. WV is "notin" as in "Dr Capybara is not in". Unusually apropos even by comparison to WV's ordinary antics, I think.